Looking for a primary battery cut-off switch for your car or boat? 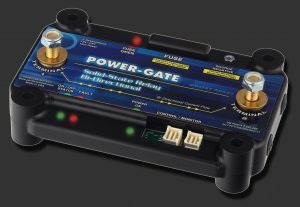 POWER-GATE Bi-directional relays can serve that purpose using solid-state MOSFET based technology….no moving parts, no arc’ing , no wear and tear. Install a micro on/off switch remotely for a convenient way to uncouple the battery(s) from the rest of the vehicle.